That’s a good question and a poor one at the same time. It’s a poor question because this is NOT about my e-book being sold to students in 29 countries and translated into 5 languages – it’s about the fact that I am highlighting it for my prospects. THAT is the point – you need ‘something’ to highlight in your accomplishments in respect of your e-book, otherwise you will remain an also-ran in the race to sell your e-book. If you don’t have any accomplishments, well read on to find out what to do! It’s a good question that has an equally good answer. In our Internet Mastery Programs, we teach our clients HOW TO CREATE VALUE so that your online products including your e-books sell. You might be surprised to know that ALL foreign editions of my e-book were translated FOR FREE by people who were so impressed by the book that they wanted to make sure people in other languages who don’t read English can access the material. Is that incredible or what?!!? How does that happen? It ONLY happens if you have a great product. 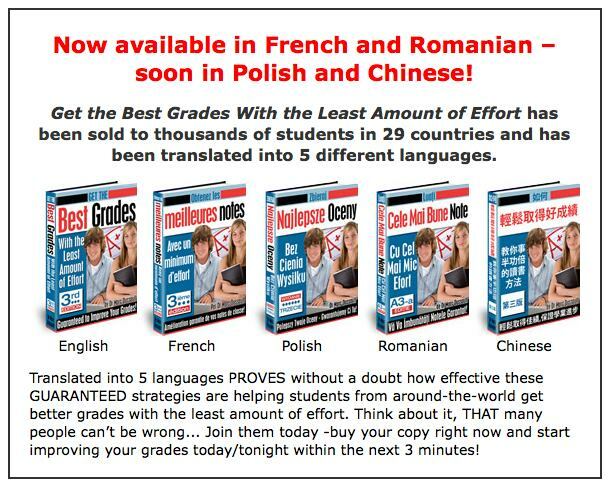 “Get The Best Grades With The Least Amount Of Effort” is a GREAT PRODUCT – the FIRST EDITION was sold in bookstores in Canada before I transformed it into an e-Book to get global distribution and leverage. Student breakthroughs are happening on a daily basis and reported on my blog on an almost weekly basis. BUT and there is ALWAYS A BUT. But nothing happens if the product doesn’t sell. You have to get your e-book to sell otherwise no one will ever translate it for you. First, you learn from the very best how to do this – step-by-step and click-by-click. Look into our Internet Mastery Programs – our most affordable program is the cost of a few e-books a month. It will be the difference between SPENDING MONEY to be on the Internet and actually MAKING MONEY ON THE INTERNET! Don’t forget that only 5% of Internet Marketers make money on the Internet – the other 95% spend more than they make with web hosting, multiple domain name registration, Google Adwords, hiring ghost writers to write articles and blog posts (that are of questionable value), pop-up advertising, Search Engine Optimisation (SEO), website design, social bookmarking, research, copy writing for their sales pages, database management, autoresponder management, payment gateway setup, etc. The reward is that when you do become one of the 5% – you end up making MORE than the other 95% combined! So the investment is worth it! Without the investment, well it’s a long hard slog! Thanks for the very informative information you provide here on your blog. I am interested in your opinion on the subject of credibility as you are obviously very succesful in your area of subjects. Do you recommend a coach or mentor of say, JAY ABRAHAM’s stature would the reward for the expense be justified in credibility acquired in a NAME e.g. TONY ROBBINS etc. or in Australia do we stay with local relevance for our markets? Great question. Not many people will ‘lend’ their names to projects – especially e-books. To try to get ‘top names’ to endorse you is not recommended – the time, effort, cost and chance of success are not worth it. Credibility is much more than a big name’s endorsement – as I teach our Internet and Business Mastery Members. It’s an ethos than once embraced is FREE and EXPONENTIAL in scope and breadth. The best thing is that it’s available to everyone — Thanks for asking!